Ahoy, Ozzy fans! I am finally in the process of getting all my vinyl into mp3 format. I chose this E.P. first. This was never released on CD, never on iTunes, never as a bonus track nor on a box set. There’s even one tune here that is not available anywhere else, in any form, whatsoever. It is called “You Said It All”. Most extrordinarily, this E.P. has Randy Rhoads. Rare Rhoads, folks! Mr. Crowley (or just Live E.P., since that’s what’s on the cover of my copy) is a nice little package featuring two Blizzard of Ozz classics: the title track, and a clipped version of “Suicide Solution” that fades out during the guitar solo. The third track is the afformentioned “You Said It All”, and I don’t know the story behind this song or why it’s such a rarity. All I can say is that it is credited to the writing quartet of Osbourne/Rhoads/Daisley/Kerslake. Which may actually explain everything right there. Sharon is notoriously at war with both Bob Daisley and Lee Kerslake over writing credits and royalties. According to the back cover, this was recorded in October of 1980 during the band’s first UK tour. While the recording is not as electrifying as Randy Rhoads Tribute for example, it’s fine for a low-key release such as an E.P. Most importantly, “You Said It All” is such a great track. The riff is catchy, the melody is excellent, the song memorable. Maybe it’s not as great as the 9 now-classic tracks on Blizzard, but it certainly would have made a great 10th track, if it was even ever recorded in a studio. Oh incidentally this was also released on cassette, I used to have that too. I remember buying this way back when,the buzz on Ozzy at that time was starting to happen,not just his offstage antics but by the band he had put together.. I wish I was aware of any music from that time period Deke, but all I was really aware of back then was Star Wars! 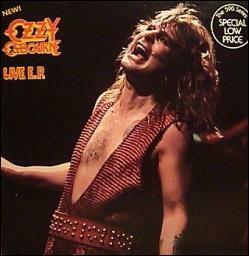 When I started seeing this in stores as I was collecting Ozzy, it was still somewhat of a rarity. I saw it on cassette in Stratford, Ontario in 1990, and had to have it. Then in 1995 one of my customers wanted to sell me a picture disc, but he wanted $80 for it. Then finally when my buddy Tom opened his record store, he got me one for a couple bucks.